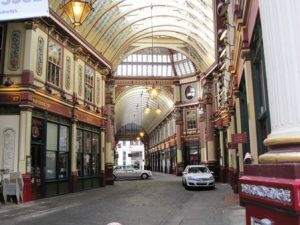 Leadenhall Market is a covered market in the City of London on Gracechurch Street.It has an ornate roof structure, painted green, maroon and cream, and cobbled floors. The market dates back to the 14th century. It primarily sells fresh food. Among the vendors there are cheesemongers, butchers and florists.